Manufacturer of costume for skating on the ice starts with the music. Designer, listening to music, making a sketch of the future masterpiece. Then begins the process of selecting the fabric. For this purpose special materials are used, because the load on the material is enormous. During classes and performances, the skaters perform difficult gymnastic stunts that stand far from any fabric. Stretch Jersey, the woven material is torn. 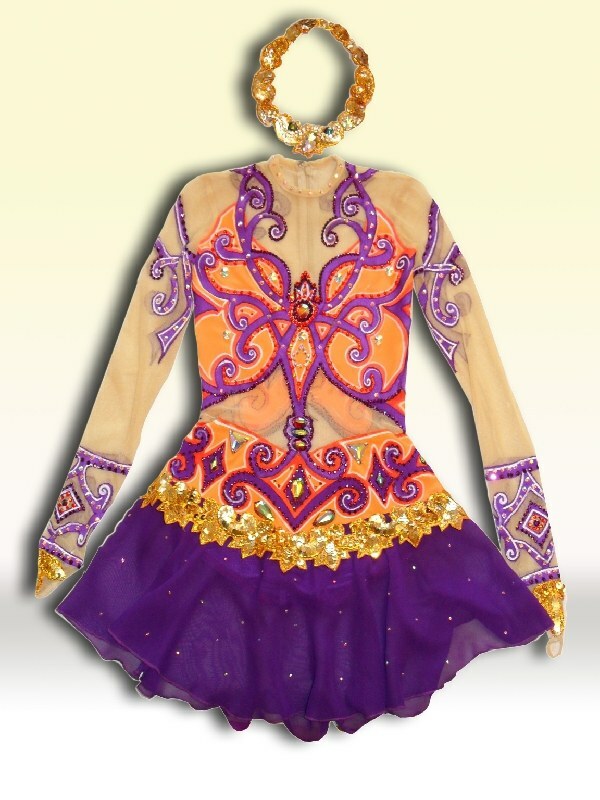 The most popular type of fabric used for making costumes for figure skating, is supplex. This material has a high degree of resistance to information, is perfectly stretched and then returned to its original state. Start with a swimsuit, if you sew women's costume. Because of special fabric, sew it on one or two sizes too small: it will fit like a glove. Prepare adjacent main pattern of the dress (see picture). The planned pattern on the waist line. Prepare the pattern narrow sleeves. Apply on line style. Make a drawing of the back. Put down four inches from mid-back to then to sew the zipper. Check. Continue up the line to the middle of the back four centimetres. Put one centimeter from Rostock on the shoulder line, from point No. 1 to three inches up. Connect point No. 3 smooth lines with point No. 4, and also with the shoulder line. Put four inches from the armhole to the shoulder and four inches to the left. Transfer the line of side seam two inches to the right. Divide the waist line in half. From the points of division set aside right and left and a half - two centimeters. Is the depth of the tuck. Make points T2 and T3. Construct two equal prongs from the waist line. Segment T2 divide in half. To do this, drop a perpendicular line equal to half the line T2. End connect straight lines from point T3. Similar build and the second scar. Excavation on the line of sewing the skirt to the bodice must match the shape and size of the tooth. Build one wedge for drawing the pattern of the skirt. Find the rest by analogy. Draw a vertical line down the entire length of the skirt. Swipe right and left horizontal lines which set the width of the wedge equal to the width of the tooth multiplied by four. Proceed to the pattern of the front part of the costume. Put the middle of the front three inches up (see picture) and place one inch from point # 3. The same distance put on the shoulder line from the neck. Aside from point # 1 up two and a half centimeters to the right. It is necessary to build the rack. Connect a straight line from the lower point of the neck point No. 1. Put four inches from the shoulder line. Determine the depth of chest Darts, put a point P.
Put the line of the side seam to the right by two inches. Aside from the line hoists the depth of the second tuck two centimeters. Draw a line from the armhole to the point 2. Construct two equal prongs from the waist line (on the back). Fold the fabric in half with the bend in the transverse yarn. Put the pattern as shown in the figure. Vykroyte details. Stitch the bridging stitch the bodice together with the lining. Will protocide burlap pocket from the inside. Vsheyte the back zipper in the middle back. Grind the sleeves and hem the bottom. Grind wedges skirts, Ratatouille seams. Will pitokiti the bias tape width of two inches at a distance of three inches from the bottom of the skirt. Embroider the bottom of the skirt over bake. Baste the skirt to the bodice at the line of scars. Make the notch at each corner of the wedge. Prostrochite to the underside of the bridging seam. Fold the face lining the top and pristrochite on the bottom of the skirt. Remove the lining inside out and attach to the seams of the wedges. Treat the rack for the top of the costume. Hem the lining to the sleeves. Carved sleeves. Tutuila iron. Sewing a men's suit a little easier. Tailor a shirt of the type "Body", fix the bottom buttons. Sew to the pants special stropki or gum for fixing skates. Stand-up collar one-piece, bodice - fitting. Vsheyte zipper on the back. Fill the bottom of the bodice in the form of scars. Skirt cut flare consists of eight wedges. Decorate the bottom of the skirt with bias binding and embroidery. Carved sleeves. They should be slanting, loose-fitting for more comfortable movement. Order tailoring a suit for figure skating in the Studio. You can also place an online order for the production of the costume (http://www.art-blesk.com/ru/suit/figurnoekatanie/). You only need to take the measurements and report them in the section "Ordering". You will be contacted soon for details. Made clothes sent by courier or taken on their own.